1.Preheat oven to 350°F. In medium bowl, mix soup, salsa and sour cream. In large skillet, heat oil over medium-high heat. Add onion and cook 4 minutes. Add garlic, 2 teaspoons taco seasoning and 1/2 teaspoon cumin, and cook 5 minutes or until onion is tender, stirring occasionally. Add green chiles, chicken and half the soup mixture, and cook 2 minutes or until heated through. Remove skillet from heat and let cool slightly. Stir in 1 cup cheese, cilantro and pepper. 2.Stir remaining 1 teaspoon taco seasoning and 1/4 teaspoon cumin into remaining soup mixture. Spread soup mixture into bottom of 13 x 9-inch baking dish. On microwave-safe plate, stack 6 tortillas between 2 damp paper towels, and heat in microwave oven on high 30 seconds. While keeping remaining tortillas covered, place 1 tortilla at a time on work surface and spoon 1/3 cup of filling down center. Fold sides over filling, then place enchiladas seam-side down and close together in prepared baking dish. Heat remaining tortillas and repeat process with remaining filling. Sprinkle with remaining 1 cup cheese. 3.Bake 15 to 20 minutes or until edges bubble and top is lightly browned. 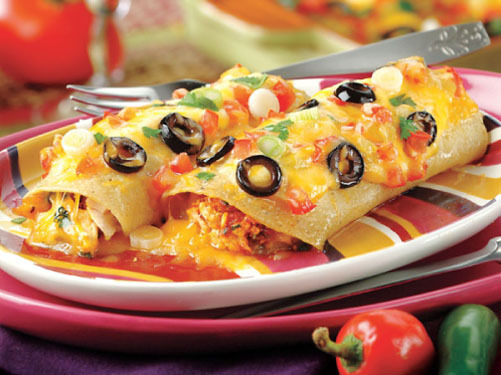 To serve, sprinkle enchiladas with olives, tomatoes, green onions and cilantro, if desired.